1909: After working for others, Ettore Bugatti (1881-1947) built his first car, the type 13, at Molsheim, Alsace. The 1913 4-cylinder 5-litre Bugatti type-18 sports 2-seater, ‘Black Bess’, sold for €2,427,500 at Bonhams Automobiles d'Exception a Retromobile auction in Paris, 7 February 2009. 1924-1931, the racing/road type 35, one of the best looking Bugattis, straight-8, 2-litres. And later 2.3-litre supercharged T35B. 1925-1930, type 37, 4-cylinder 1.5-litre, and supercharged T37A. 1926-1933 the luxurious type 41 Royale, straight-8, sohc, 12.7-litre was the wrong car for the times and only six were built. 1926-1932 type 50, sports car in various body styles, dohc. 1931-1934 type 51, straight-8, 2.3-litre supercharged. In August 2016, a type 51 sold for us$4,000,000 at Bonhams 'Quail' auction. 1932: Two (3?) type 53, straight-8, 4.9-litre, supercharged, hill climb / racing cars were built with four wheel drive. 1932-1934, type 54, straight-8, 5-litre supercharged. 1934-1939: Type 57 3.3-litre straight-8 unsupercharged, also 1935-1939 57C supercharged, 1936-1938 57S unsupercharged and 1936-1938 57SC supercharged. The 57S and 57SC were lowered and had a shorter wheelbase [Geo00]. Racing versions won the Le Mans 24-hour race in 1937 and 1939. A Bugatti type 57S sold for €3,417,500 (au$6.7million) at Bonhams Automobiles d'Exception a Retromobile auction in Paris, 7 February 2009. A 1937 57SC Atalante sold for us$7,920,000 at the 2008 Pebble Beach auction. 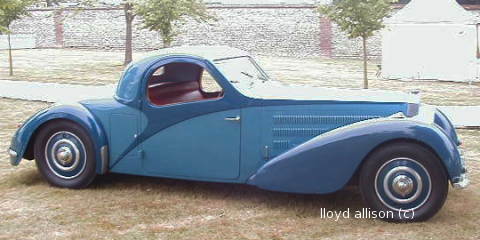 A 1936 Bugatti Type 57SC Atlantic, chassis #57374, sold reputedly for over us$30 million, 5 May 2010. 1963: Bugatti was bought by Hispano-Suiza (no longer making cars) which was later acquired by SNECMA [Geo00]. 1991-1995: The last "proper" Bugattis were built in the 1950s, but the name was revived in the 1990s with the 3.5-litre V12, quad turbo., mid-engined EB110 (Ettore Bugatti 110th anniversary), us$456K. The car had a 6-speed gearbox and four wheel drive and was said to be capable of 210+mph. A 1995 Bugatti EB110 SS 'Sport Competizione - Le Mans' sold for €941,700, us$1,050,890, at the Retromobile Salon auction, Paris, 6 February 2016. A 1994 EB110 Super Sport, chassis #ZA9BB02E0RCD39012, engine #086 sold €2,030,000 for at RM Sotherbys Retromobile auction 6 February 2019. 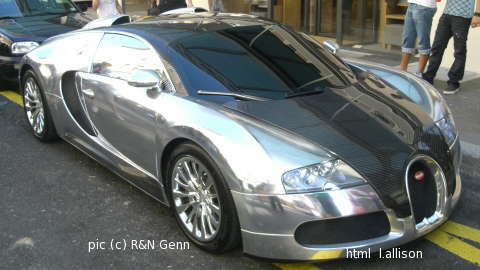 1998: Volkswagen acquired the Bugatti name and showed a front-engined W18 Bugatti concept car (the 18 meaning 18 cylinders!) at the 1998 Paris Motor show. The W format of cylinder banks, was a development of VW's narrow angle 5- and 6-cylinder V engines, but this flight of fantasy had 6.3 litres, 72-valves and direct (petrol) injection to achieve 410kW power and 650Nm torque. It raised the stakes on even VW's own W12 super sports car concept, perhaps trying to emulate the historic Bugatti Royale. 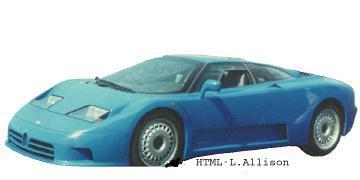 The EB118 Bugatti had an aluminium chassis (shades of Audi) and used four wheel drive to get the power to the road. 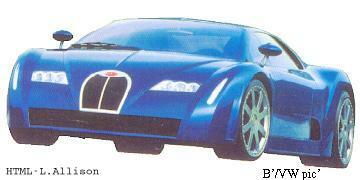 1999: VW showed the Bugatti Chiron mid-engined concept car at the Frankfurt Motor Show. The Chiron was 4.2m long and 1.5m high. Powered by a W18, 6.3 litre engine with 72-valves (=4x18), and producing 408kW of power and 650Nm of torque, the Chiron could only be described as extravagant. 2007: Bugatti allowed Top Gear's James May to verify the 250mph top speed (253 in fact) of the Veyron on VW's test track, although they would not allow the "Stig" to take it around the popular TV show's own test track. 2009 September: Bugatti revealed the front-engined 16 C Galibier 4-door prototype fitted with a version of the 8-litre W16 engine with "two stage supercharging" and capable of running on ethanol. The car had ceramic brakes and four wheel drive. 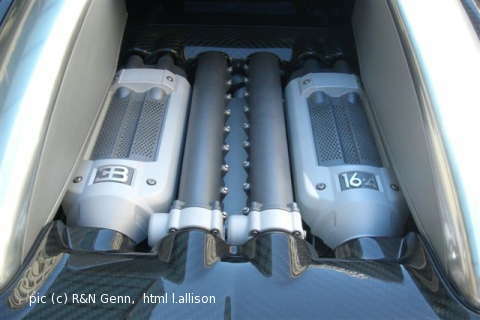 2010, July 4: A Bugatti Veyron 16.4 Super Sport raised the speed record for a “production” car to 431.07km/h (267.9mph). 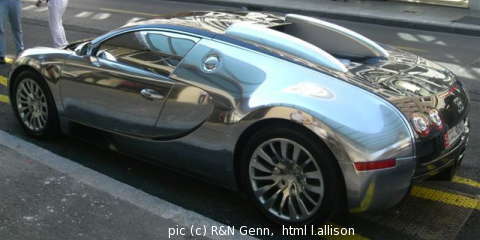 2011, June 24: "The final Bugatti Veyron has now been ordered ..." -- B. 2012: The 4-door Bugatti Galibier due to go on sale (also see 2009). The project was cancelled ~2013. 2016, March, Geneva: Bugatti revealed a pre-production Chiron, looking very much a Veyron+, 8-litre, W16, 4-turbo, 1,103kW, 1600Nm, 400+km/h (a distant resemblance to the 1999 'Chiron' concept car). Deliveries to customers began in March 2017. In December, Bugatti announced that it had delivered its target of 70 Chirons for 2017.